Cologne - It was a long time coming but, at the 23rd time of asking, Borussia Mönchengladbach finally managed to beat Bayer 04 Leverkusen on home turf last Saturday, bringing closure to the longest run of its kind in Bundesliga history. More pertinently in the immediate context, the Foals moved five points clear of die Werkself, their direct rivals for an automatic place in the group stage of next season's UEFA Champions League. With just two games to go, a point at SV Werder Bremen this weekend will now be enough to attain that target, regardless of how Leverkusen perform. 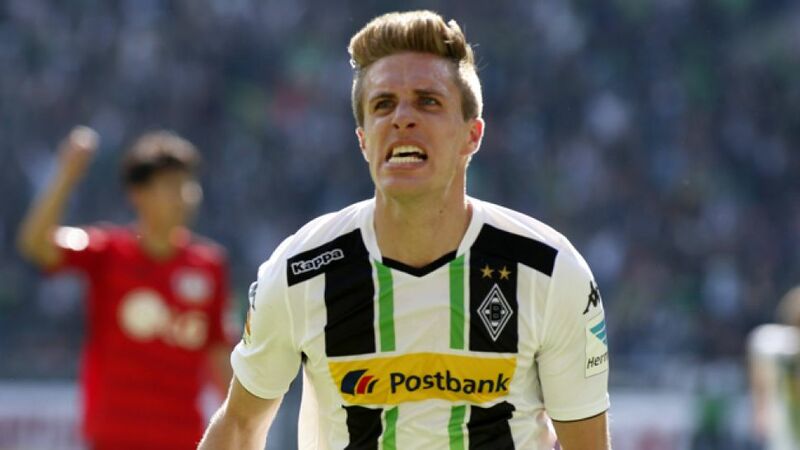 Gladbach have not enjoyed a season like it in almost 30 years and no player has been more pivotal to their newfound success than Patrick Herrmann. Over the second half of the campaign, in particular, the 24-year-old attacking midfielder has been leading from the front for the best Bundesliga team of 2015 so far. It is in their own hands to wrap things up at the Weserstadion on the penultimate Matchday and Herrmann, who has featured in every game since the winter break, all but twice from the start, will more than likely have a central role to play in the proceedings once again. On the books since age 17 and a graduate of the famed Foals football academy, he is now coming to the end of his fifth full Bundesliga season and it is one that has seen him take a quantum leap, not least in terms of his goalscoring. Valued above all for his pace, vision and precise passing, the slightly-built talent also hit the net half-a-dozen times in each of the past three campaigns. This time around, he is on course to double that tally after bagging season goal number eleven against Leverkusen. Eight of those have been scored this calendar year, kicking off with the 1-0 deciders against VfB Stuttgart and SC Freiburg in the first two games after the restart. Those matchwinning performances were all the more precious to the Gladbach number 7 given the shaky opening to 2014/15 that saw him only make his first starting appearance on Matchday 6. It was, by his own admission, “a very tough time for me, it hurt.” He emerged from it evidently all the stronger and at the start of April, the widely coveted attacking all-rounder put pen to paper on a new contract valid through to 2019. They got the briefest of tastes of it back in 2012 when Borussia were beaten on aggregate in the play-off round by Dynamo Kyiv, but the team have progressed considerably since then under the astute hand of head coach Lucien Favre. Determined to avoid the potential pitfalls of pre-qualification this time around, they aim to finish the job on Saturday, against a Bremen side themselves still in the hunt for a UEFA Europa League berth. With that done, Herrmann would have a bit more time to ponder one of his other personal targets. He has been called up for Germany before, but is still waiting to take his bow for the senior team. “If you've been there once, you want to get there again. I can only make my case by playing well for Borussia.” He is certainly making his case at the moment.